This post contains affiliate links for which I receive small compensation for any purchases made through these links - thank you for your support. Or should I say, it's a quilt? Either way, the top using techniques from my January Book of the Month selection, Improv Patchwork, now consists of three layers, held together by stitches - the definition of a quilt! Introducing Hippo Blue, because it's blue and there's hippos. How creative is that? I'm happy with how this ultimately turned out, though I do wish I would have incorporated the orange sooner. But it all worked out, especially with the Tangled Triangles pantograph adding the perfect touch! Looks like freehand random triangles, but no, it's a pantograph, with repeating rows of four nesting triangles. 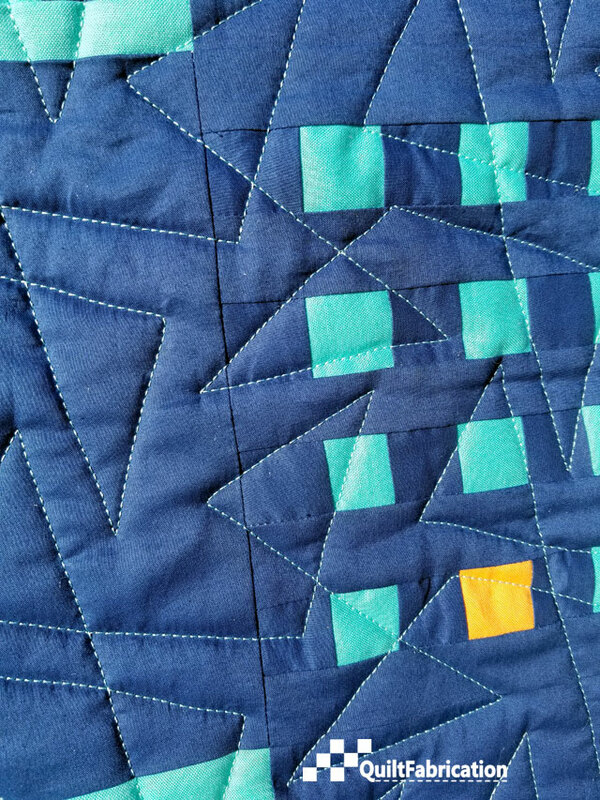 Though those triangles weren't freehand, the quilt blocks were. All the strips for making the blocks were freehand cut - no ruler at all! I tend to cut fairly straight, and any wavy lines ended up disappearing when stitching. And there was no lining up of seams or squares in those blocks, which is easier to see in this pic. Stress free assembly! Just so you know, I don't have a computer driven stitching system on my machine. Following the pattern with a laser light (no ruler here!) makes for a few wobbly lines. But I did my best to be smooth, and to make great points, for which I have a quilting video showing how to do this - Quilting Square Corners. And the back? It's that cute hippo fabric I found in my stash, after I put the top together. It was that piece that was the inspiration for adding orange to the front. To get this to the proper size, any and all extra pieces were sewn together - no leftovers here! Now we just need to contact mom to let her know it's ready, and her son can play away! This turned out lovely. 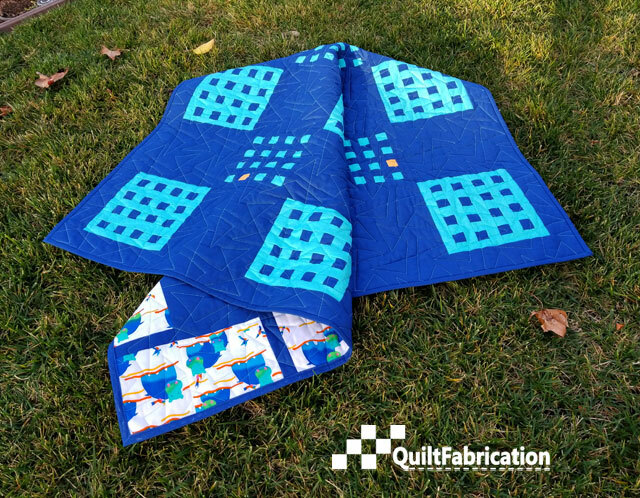 I think the triangles are a great motif for this quilt. Thank you so much! It really did come together nicely, since there really wasn't much of a plan to start with! This is a great quilt. 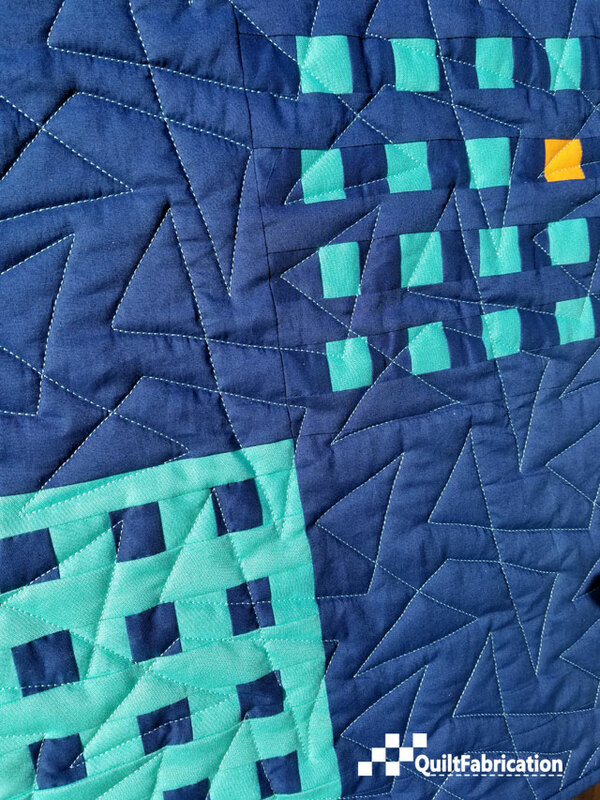 I love the hand cut blocks and the triangle quilting. it turned out great, love the quilting on it. That is so awesome! And really, you are not along in this style of quilting - there are many beautiful quilts from many quilters out there. I love it! 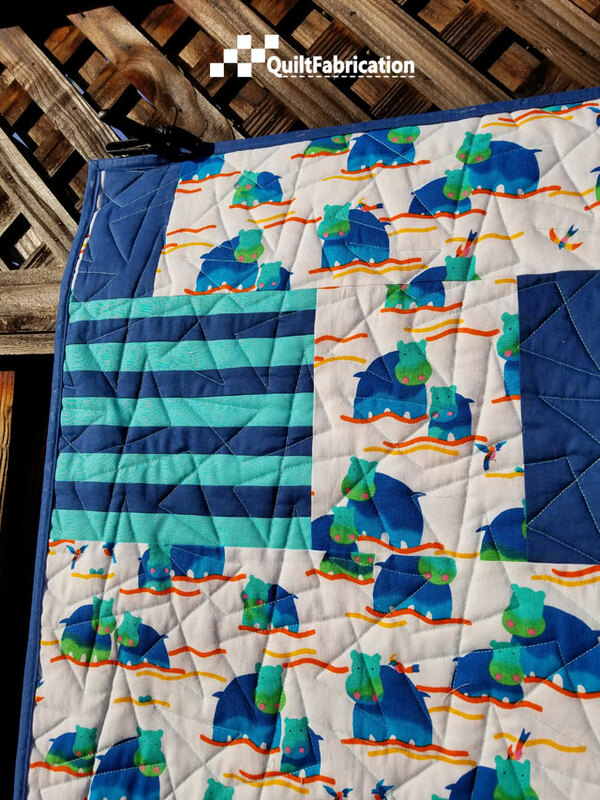 The quilting is perfect and I love the hippos on the back! So fun! You did a great job. I knew you would pull it together. The hippos are so darling. Thanks for sharing your experience. What a fun quilt. I like your choice of the triangular quilting to play against the squares. Lovely work. Thanks Ann! It really is the perfect fit! Fun and modern. The orange square give it the perfect touch of interest that brings it to life! Thanks for sharing!! No offense intended, but I have a sneaky suspicion that the hippo side of this quilt will prove more popular than the improv pieced side. The addition of the orange squares was a great idea even if it was a pain to implement. That turned out so cute! I love the splash of yellow in there. 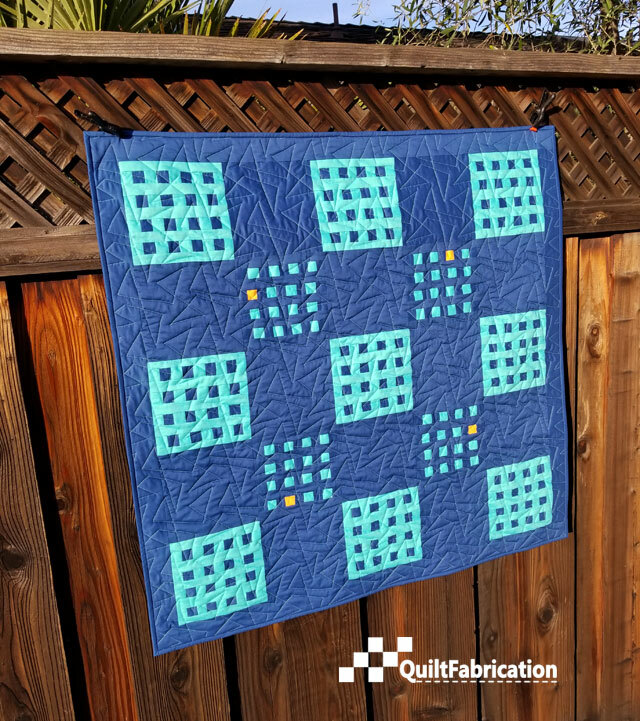 Love the triangle quilting. And those adorable hippos. Yes that was the perfect quilting for it! Congrats on the finish. 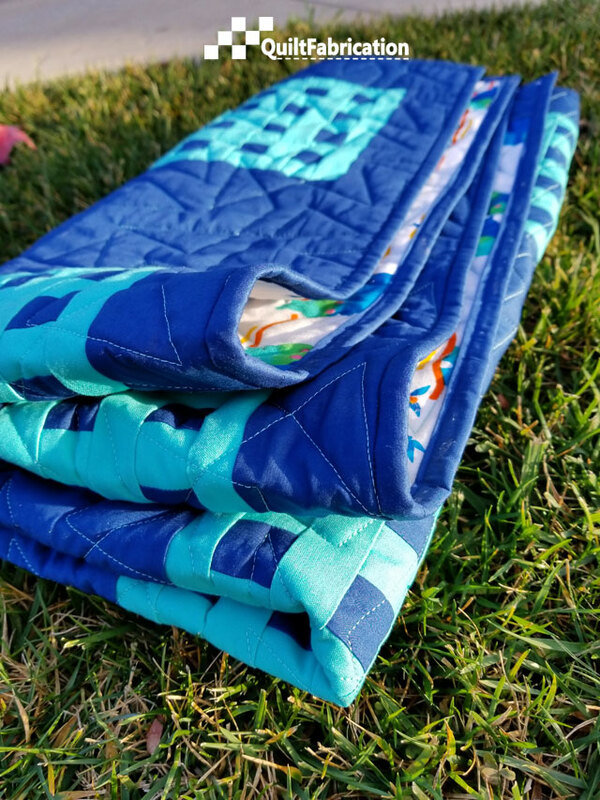 I must say Susan that I would have never thought the quilt would have turned out so pretty! What a finish! Just the 4 oranges makes it!!!!! Same here! Hubby, son, and I were all not to thrilled with it before the orange squares. But that little change and the tangled triangles panto made the quilt. Lesson: don't give up on a quilt until after the quilting. I really do like this quilt! The hippo fabric is so fun, and the piecing works with the orange pops! A winner! 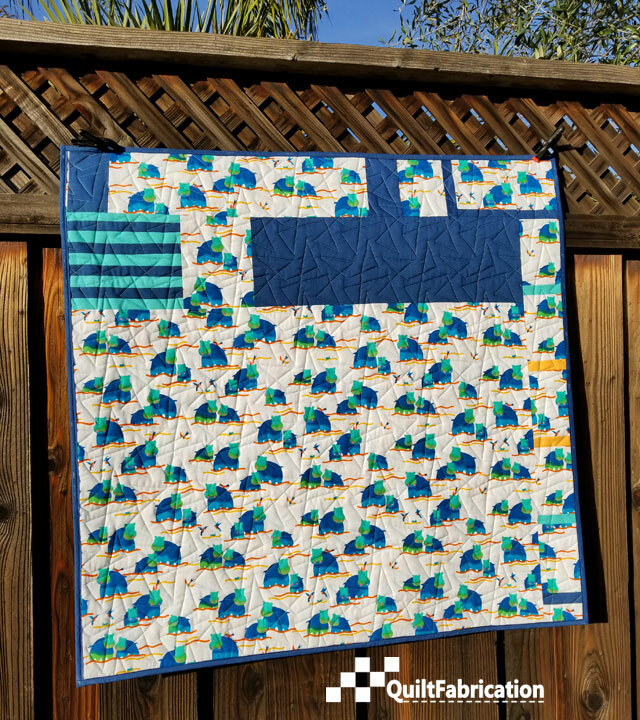 This is such a fun quilt!! REally love those pops of orange. More orange might have been too much, anyway? Thanks for the tip about the corner pause.